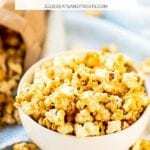 If you are looking for a quick way to make your favorite homemade Caramel Corn recipe you have to try this delicious Microwave Caramel Corn! It’s the perfect snack to treat your kids with after school, on movie night or to pack in their lunches or on the bus for events. We can’t get enough of this recipe. I was out at the in-laws today and my hubby’s step-mother mixed this yummy treat up. I’m used to making my Caramel Corn in the oven, so when she started talking about a microwave caramel corn I was thinking really? Could it be possible? She quickly made this while we chatted away in the kitchen. I couldn’t believe how fast it came together! 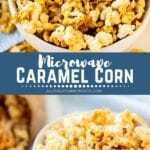 I instantly knew I had to make my own homemade caramel corn in the microwave. I mean you make it in a paper bag you get to throw away instead of scrubbing a pan. How amazing is that?! So we went home and I quickly mixed it up that afternoon. Yup it was amazing. And simple. I love my other recipe too, but if I need a quick treat to bring somewhere this is my go-to recipe! I just in Chicago this past weekend and we visited Garrett Popcorn and it was EPIC! I personally had the caramel corn and chocolate covered popcorn mixture and it was sinful. I’m pretty sure I ate my weight in it. Next time, Julie, do not buy the LARGE bag for yourself because you have no self control. Next up on the blog, homemade caramel corn with chocolate covered popcorn in it! Ready for it? Ready for it? 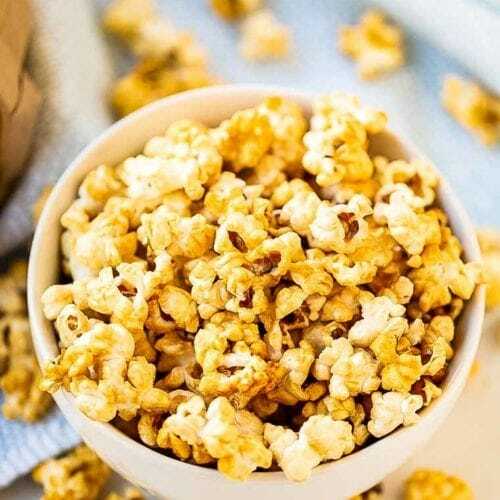 What do I need to Make Caramel Corn? Tools you may need to make this recipe – My favorite Air popper, measuring cup and spatula. 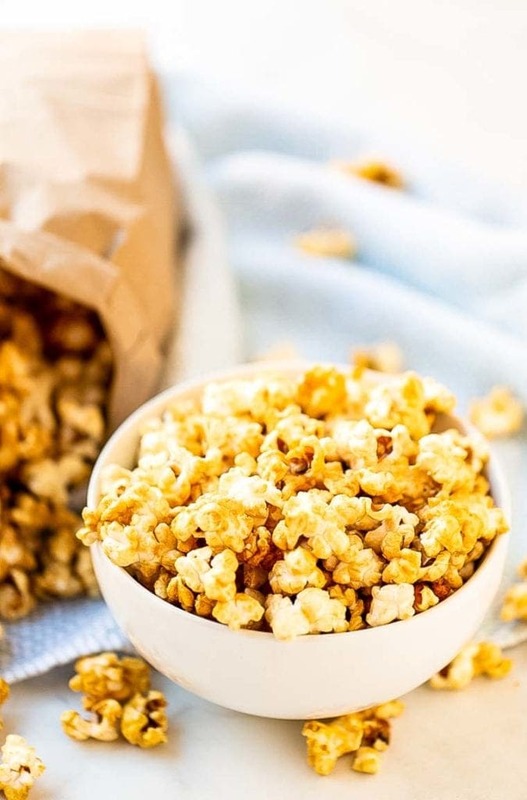 How do You Make the Best Caramel Corn? Melt the sugar, salt, corn syrup and butter in the microwave for three minutes until bubbly. Stirring at one-minute intervals. Add the vanilla and baking soda, mix well. Put popped popcorn into a brown grocery bag. Pour brown sugar mixture over the popcorn. Shake bag to mix in the caramel. Now microwave the bag in one-minute intervals three times. After each minute remove the bag and shake it well. Pour onto wax paper and let cool. Ok… let’s say you have some leftovers. (Hard to believe because this just doesn’t last long!) But let’s just say you do… store leftovers in an airtight container in the pantry. Why do you add baking soda to caramel? When you the baking soda in the caramel mixture it reacts with the acid from the brown sugar and corn syrup. This creates tiny carbon dioxide air bubbles and creates the foaming you see. 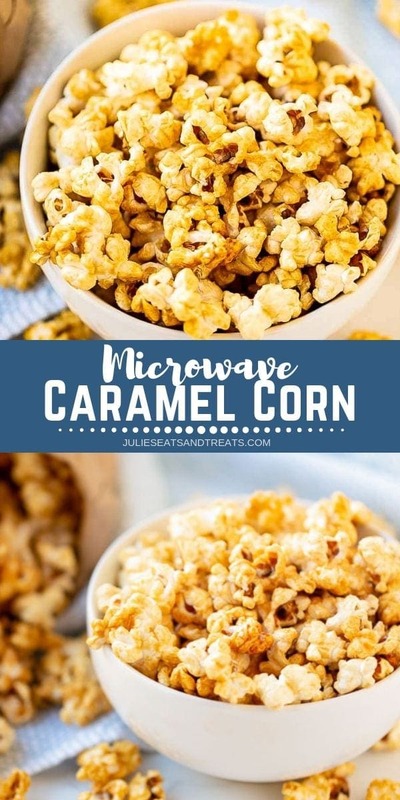 Once the caramel has cooled on your popcorn the air bubbles inside the caramel create a softer texture! 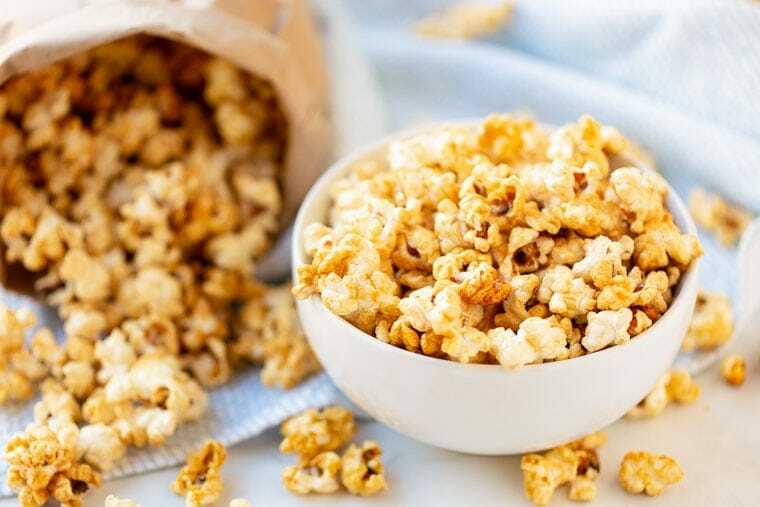 How do you make caramel corn crispy again? What if it gets soft and isn’t crunchy? Don’t throw it away! Just spread it out on a sheet pan and bake it in the oven at 250 degrees. Stir it every fifteen minutes and bake it until crispy. More easy treats and tasty snacks to enjoy! 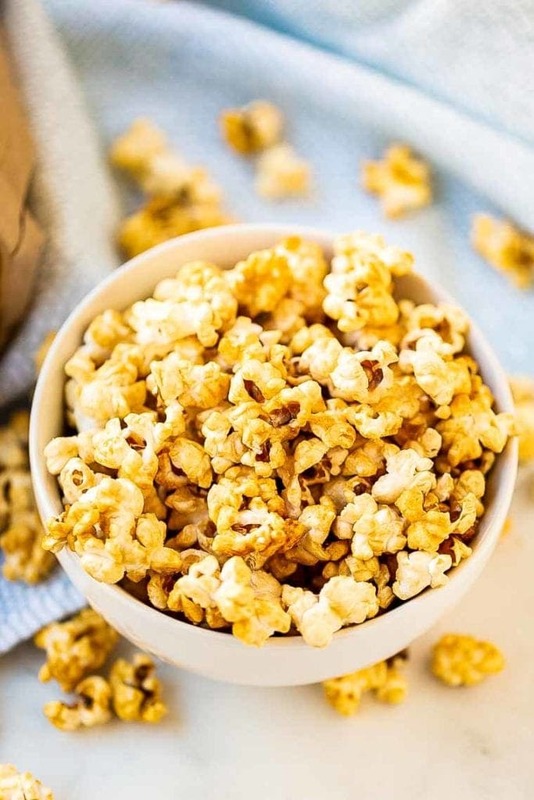 A quick and easy way to make your favorite homemade caramel corn! This recipe uses the microwave to make it so it's fast, easy and delicious! 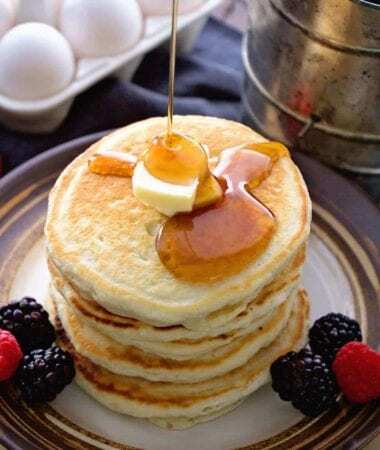 Melt brown sugar, corn syrup, butter, and salt in microwave for 3 minutes, stirring in one minute intervals. Add vanilla and baking soda to brown sugar mixture. Mix well. Put popped popcorn into a brown grocery bag. Pour brown sugar mixture over the popcorn. Shake bag. Put grocery bag in microwave. Microwave for 3 minutes. After each minute take bag out and shake. After three minutes microwave for 1 minute and 30 seconds. Shaking after each 30 second interval. Pour onto wax paper and let cool. I know right? Before it was like oh it’s going to take so long to get the finally results is it really worth it? Now it’s like oh ya give mamma some caramel corn! How easy is this?! Love it!! The baking soda makes ALL the difference! DO NOT SKIP THIS, people!